Dazzling Diamond Rings for Every Occasion | Rocks & Co. Style and fashion have become increasingly fun and bold with each new season. 2019 brings some exciting trends for jewellery, one being statement jewellery. This means oversized settings, large stones and/or many gems, in minimalist, creative, and ornate settings. For Diamond rings and Diamond jewellery, this trend is fun because it can include the incorporation of black Diamonds, white Diamonds, and colourful fancy Diamonds. Stand out shoes and bags have had and continue to have their day in fashion, but now is the time for bold jewellery! Luxurious Diamond rings are already bold because of the value and fire of the stones, but when created as a statement design, such as a group of tiny pavé-cut Diamonds, set in a gold dome ring, we have a winner. And there you have it, a statement ring also known as a cocktail ring. Not to worry classic fans, the classic Solitaire and three stone Diamond rings styles, etc., will always be a standard, no matter the trend. Back to the forecast! Multiple ring stacking and necklace layering are bigger than ever. The runways have been full of layered accessories looks. Stack your rings, bracelets, and necklaces! Don't be afraid to mix gemstone types and colours together, as well as precious metal setting colours. A Diamond ring can easily mix with a Sapphire pendant or Ruby earrings, for example. Black Diamond rings are quite intriguing. The shiny black gem appeals to the Goth in all of us, which is actually a Victorian influenced style, when you look closer. White Diamond is pure polycrystalline, but when graphite and amorphous carbon come into the mix it becomes Carbonado, or black Diamond which are only found in Brazil and central Africa. A black Diamond ring with several stones set in sterling or gold is just stunning. The contrast is quite impressive and rich. Black Diamond rings, with their classic jet-black hue and incredible shine, are very beautiful indeed. A black Diamond ring is a great addition to your collection! The Diamond Solitaire is as classic as strawberries and cream. A single stone Diamond solitaire ring's price depends on the quality and size of the stone. For example, our Cavill VS 18k Gold Diamond ring is a healthy size with a very decent price. Like this ring, some solitaires actually have a few smaller side stones. This bends the one-stone-only rule of the solitaire definition just a bit! By the way, this quality of solitaire ring can fetch far more in the market than we charge. One tip when buying a solitaire Diamond ring is that the smaller the stone, the bigger the chance for a lower priced ring. However, the grade of the Diamond has a huge role in value and price. The greater absence of inclusions the more expensive the Diamond solitaire ring will be! Yes, Diamonds are a girl & boy's best friends. Just as with true good friends, Diamonds are rare and very valuable indeed! Your Diamond necklace bestie can simply be the classic solitaire pendant of a white, black or fancy diamond sitting comfortably in a pronged or bevel setting, anchoring a delicate gold or silver chain. Or it could be a multi Diamond necklace, which is definitely a few tiers up in value and price. 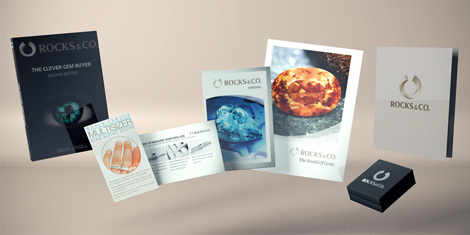 At Rocks & Co., we like to offer both levels in addition to affordable, mid-price options! A Diamond necklace, no matter the size, upgrades everything that you wear with it, plus it gives one a well-cared-for feeling. A big part of self-adornment and self-care! Make your style debut for 2019 in a new pair of Diamond earrings. The world's strongest and brightest gemstone framing your lovely face is not a bad way to start the year! Try a simple and gorgeous pair of solitaire stud earrings and keep it classic. Or go a little wild and invest in a pair of three-diamond earring studs. There are traditional teardrop shapes and mini to large chandelier styles to choose from. A Diamond bracelet will glamourize your outfit with the world's hardest and brightest gemstone, but that's not the end of the story. The cool thing about delicate, valuable Diamond jewellery is the knowledge that you are adorning yourself with something that you love and that has great value. It's kind of like an open secret. Your Diamond bracelet can be a delicate gold or silver chain with one Diamond set in it or dangling, or it can be a multiple stone bracelet, which brings the value and investment up to a whole new level. Luckily there are quite a few Diamond bracelet style and price options with us at Rocks & Co. Bold accessories are one of the fashion trends of 2019. Statement rings, cocktail rings and other statement accessories are here. A gold Diamond ring with a large dome filled with pave Diamonds is definitely a statement and something to gab about at the cocktail party. According to the international style reporters, men's bling has made a slow but very steady arrival on the runway and off. The NY Times writes that it started with the addition of men's fashion weeks a few years ago, and of course, with the influence of the Madmen of Instagram. Men's rings are the hottest sellers of men's accessories around the world. There have been other moments in history when men rocked the bling especially rings much more so than women. Men's Diamond rings truly are a man's best friend! Or you would think so with the enjoyment of Men's Diamond rings in the fashion and real world. Comfort is very important to men in all forms of fashion. Dome shapes, wide bands and very good finishing of the precious metals are key. Pavé, solitaire, eternity and more are all available for men in the ring department. In fact, forecasters are seeing more and more of a unisex trend in jewellery design. So, gals grabbing a men's diamond ring for size and comfort are shoppers of the future. The next big thing for men's style? Necklaces! Check it out, gents.